Yep, I’m banging on about old Mercs again. Being a fan of Sleeper or Q cars, I couldn’t really pass up the opportunity to write this post and perhaps prompt someone into buying and giving her good home. 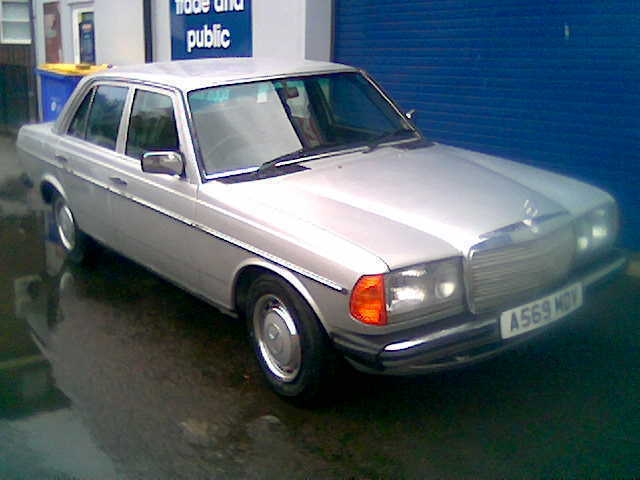 After all, this is a real classic, one of the ‘last of the proper Mercedes’. The W123 is a timeless and over-engineered car quite capable of clocking up half a million miles if serviced correctly. This model – the 230E – wasn’t particularly fast, but then it wasn’t supposed to be; it was a solid car with a comfortable, reassuring and quiet ride. I owned the more powerful 260E with the inline 6, and although it was 20 years old, it was smooth, solid, no rattles, and all the electrics still worked. Despite its lack of power, the 230E featured here as a trick up her sleeve in the form of a Mercedes 500E V8 transplant. Although there is some confusion regarding the previous model and its corresponding engine number (the M117 wasn’t installed into a 500E as the 500E received the M119), given a good servicing the M117 could probably achieve somewhere in the region of the 200+-bhp mark. The aforementioned 500E was actually called ‘the sheep in wolf’s clothing’ by the press as it could hit 62-mph in 5.5 seconds – no mean feat in 1990 for a big car. The 230E pictured here would expect to hit 60-mph in around 12 seconds, the sort of car you’d expect to see a tweed-attired silver top trundling around town in for his newspaper and pipe tobacco. With over double the engine displacement and with some modern bits and bobs replacing dated components, this sleeper could expect to match that of a modern hot-hatch. And let’s not forget this model is significantly lighter than the much larger 500E, so this is also a bonus. The engine transplant was professionally undertaken, so no need to worry too much about that. I do wonder how the handling has been compromised, although I’m assuming this has been taken care of with stiffer front suspension. It’s a bit scruffy, but considering her age, she’s in the initial restoration stage – she only needs the basics done to bring back to her former glory. If I had the space, but more importantly, an understanding wife (she doesn’t realise that cars have feelings too…) – I’d snap her up. Here she is, the 230E Sleeper.